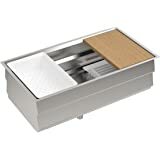 Sold by ePlumbing Products and Fulfilled by Amazon in easy-to-open packaging. Gift-wrap available. 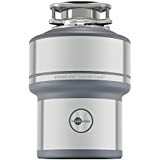 Sold by ePlumbing Products and ships from Amazon Fulfillment. Take touchless to a whole new level of convenience. 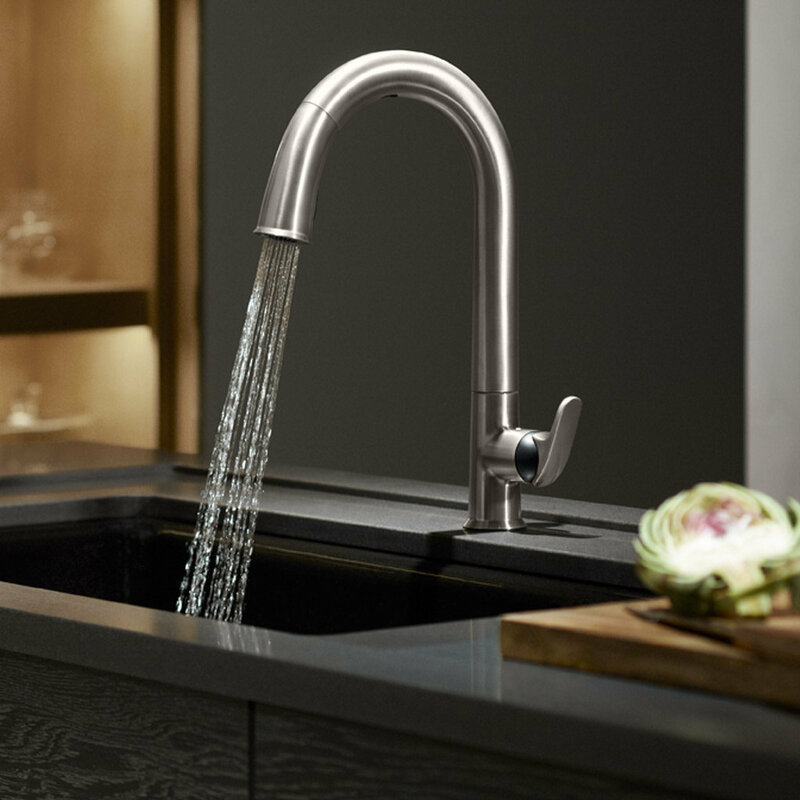 The Sensate touchless faucet frees your hands so you can speed through cooking and cleanup tasks while enjoying a cleaner, more hygienic kitchen environment. Sensate's intuitive Response(TM) technology is in tune with your every move: a simple wave of your hand--or an object such as a pan or utensil--turns it on or off. 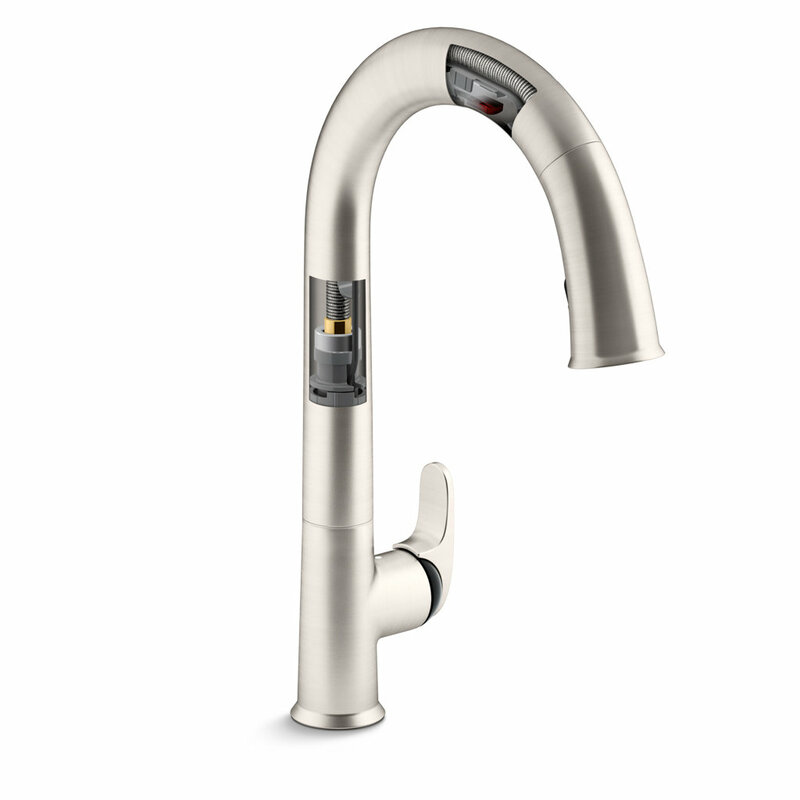 The faucet's sensor is precision-designed to provide reliable operation every time and to prevent false activations when you're working in the sink area. 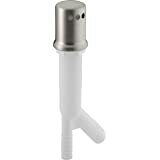 DockNetik(TM), KOHLER's new docking system, secures the pull-down sprayhead to the spout using magnetic force. 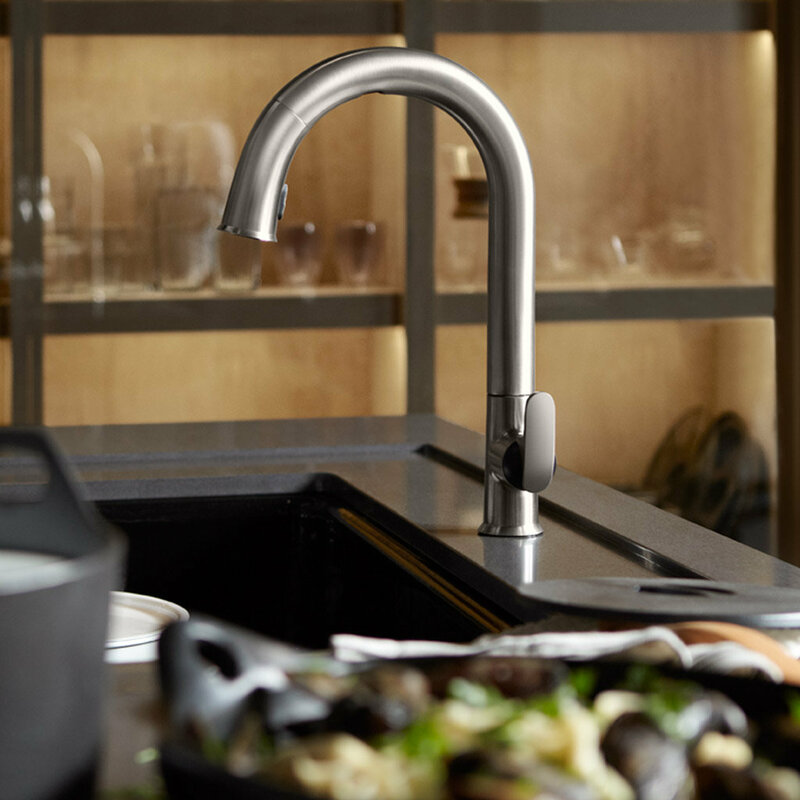 The Response technology of the Sensate touchless kitchen faucet responds to your movements, leaving you to wonder how you ever prepped, cleaned and cooked without it. Tackling daily kitchen tasks often leaves your hands messy, full or even both. 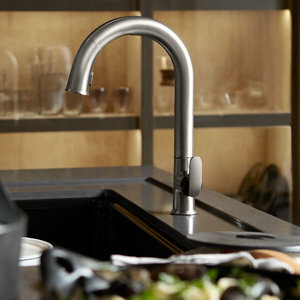 KOHLER has simplified and streamlined the kitchen faucet to make your time in the kitchen more efficient. 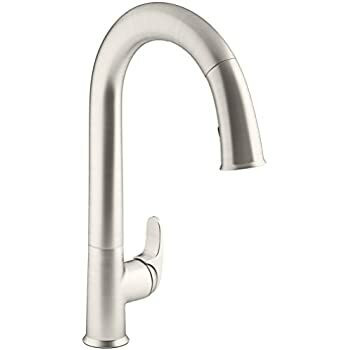 Delivering convenient and hygienic control, this intuitive faucet reduces the threat of cross-contamination. Sensate has many convenient features such as an automatic shutoff safeguard to make cleanup easier. 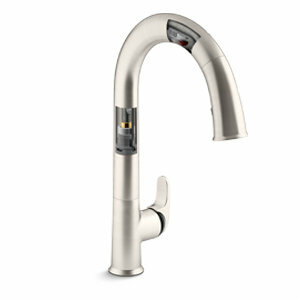 The Sensate kitchen faucet frees your hands so that you can flow through your kitchen tasks, like messy food prep, without pausing to turn the faucet handle on and off. And you don’t have to worry about spreading the mess and germs to the rest of the kitchen. The state-of-art sensor responds in 20 milliseconds. 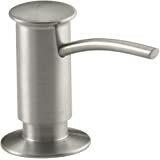 Simple wave your hand or a pot or pan through the sensor window for reliable on/off operation. 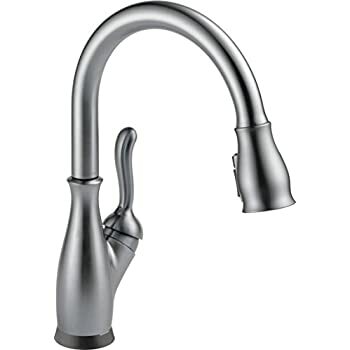 The window begins at the underside of the spout and extends six inches toward the base. Simply wave your hand through the beam to activate the water. 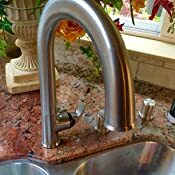 If you need to change the water temperature, simply adjust the handle while the faucet is in use. Sensate features DockNetik, our new magnetic docking system that securely locks the sprayhead in place. With spray and stream capabilities, the dual-function sprayhead makes tough kitchen tasks light work. The braided nylon hose prevents kinks and tangles, and the swiveling ball joint ensures smooth operation with minimal effort. 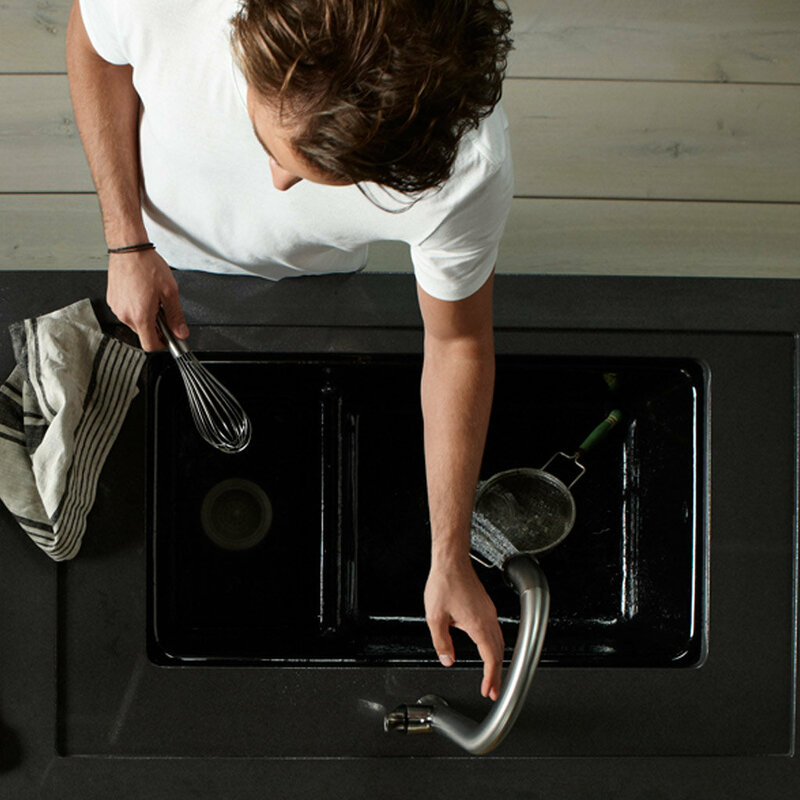 The fusion of sleek design and workhorse functionality allows you to accomplish kitchen tasks more cleanly and easily. Sensate's signature aesthetic element is the black bonnet - an unexpected touch that adds a subtle detail to its design. A finished-matched bonnet is also available. The strategically placed activation area makes use precise and natural. An LED light near the base of the faucet alerts you that the Sensate is operational and ready to go. 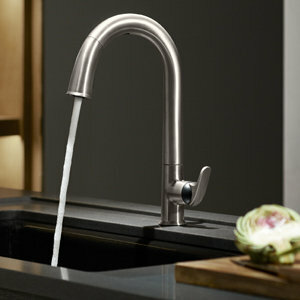 And in the event of a power loss, the faucet can be operated manually. 1.0 out of 5 starsDon't like this one, bad design. Really bad! 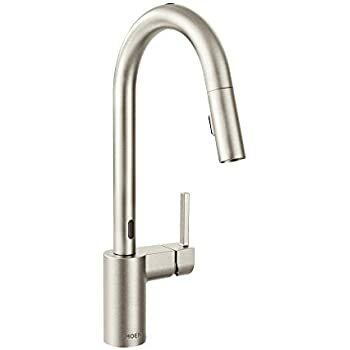 I bought another brand before this faucet about 4 years ago. That one you touch to activate. It started to malfunction about a year ago, so the Kohler is it's replacement. As soon as I installed the Kohler, I didn't like it. Reason 1, you can't control the flow at the low end, it's like it's set to medium. If you try to go any lower it shuts off. Reason 2, the high flow is not as high as the last brand. Reason 3, the spray is so fine that it splashes quite a bit, unlike the last one where the spray was much larger, that is the little nozzles are smaller on the Kohler which make more of a fine mist. And since you can't control the low end flow, that mist is powerful. To late, it's installed. Can't send it back! Not happy, and the price was twice as much as the other brands. You would expect a better functioning product. Update after 5 days of use. The temp control handle seems to be hooked up to the solenoid switch. The only position you can put it in and get a "lower" flow is center, so a little hot, a little cold. 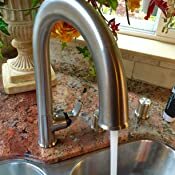 If you use the full hot or full cold, the water is on full!, which BTW, as I mentioned is about half the flow as my old faucet. Really lame design, I mean really Kohler! At least the no touch feature works (for now). 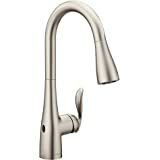 I really wanted to like this faucet. Every feature works just the way I like. It looks great, and when it's working it makes working at the sink so much better. 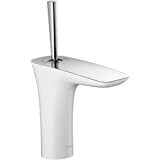 But it will be a very long time before I ever purchase a Kohler faucet, or for that matter, any Kohler product again. 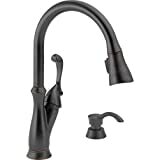 As with so many other reviewers the primary problem with this faucet is the solenoid. 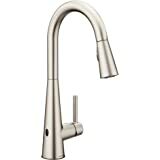 I have had the faucet less than 3 years and have just experienced the 3rd solenoid failure. I have very low mineral content in the water and no mineral will build up on the areas exposed to water so I don't expect mineral content as a contributor to the problem. Once the solenoid fails it is possible to dial in "manual mode" by turning a plastic serrated stem, but the stem is extremely difficult to turn with bare fingers. There is a slot in it but it is not formatted for a conventional screwdriver. Making it so difficult to dial in the override for the solenoid problem just adds insult to injury. They should provide a tool or handle to adapt to the end of that plastic stem. 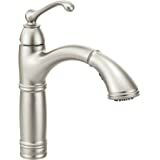 Each time the faucet failed I called the Kohler number for service. They were always very pleasant. They would send me on a wild goose chase going after the possibility of plugged filter, plugged aerator, turning the plastic solenoid stem in and out, and then finally would concede it must be a solenoid problem. They typically promise that it will arrive in about 2 weeks, but the last time they said it would be a month because they would have to manufacture more parts. It finally arrived about 2 months later. 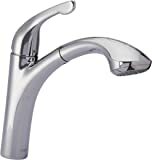 I really don't know anything about the engineering of solenoids for faucets but I don't see how it could be so very different from solenoids that are used for water-flow products like ice makers on refrigerators, or washing machines, or water timers for garden sprinklers. 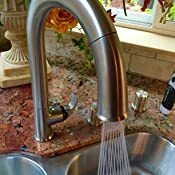 I strongly recommend against purchasing this faucet until Kohler gets this solenoid problem and their production/delivery problem fixed. This faucet is not only great looking but also it's very functional. 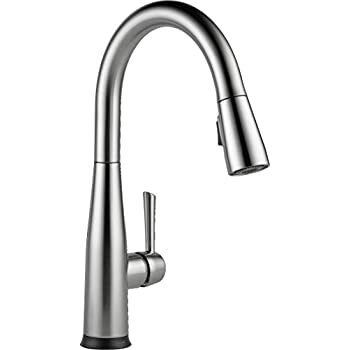 I bought the stainless steel with black accent and it has added so much to the look of the sink. 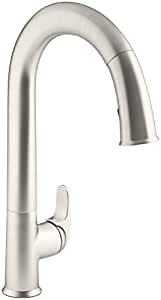 The motion sensor works precisely every time and as long as I leave the handle on the same setting (cold or hot or somewhere in between) I don't have to touch this faucet at all. This make it very easy to use specially when my hands are dirty and I just want to rinse them rather than touch the faucet, wash my hands and then wash the faucet. The installation was not that difficult from what I observed. 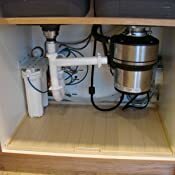 The electronics need to have an electricity outlet under the sink, which most kitchens have already. We did not have to buy any special tools or sealant to prevent leaks. 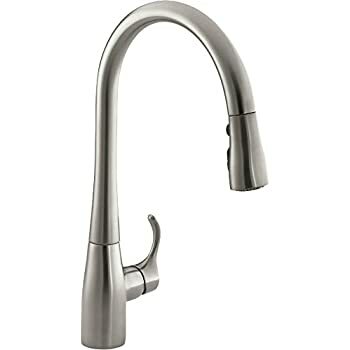 The hoses and the fittings for this faucet come with great washers already and after my husband put it together there was no leaks. 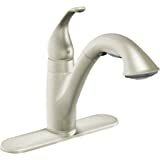 It also seems like the water pressure has been improved comparing to the previous faucet. 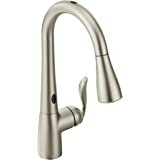 I know there are some reviews with less than desirable quality on this faucet, but I have had great experience with Kohler before on a similar faucet but without the electronics. I decided to give this a shot and so far (four months) I'm very pleased with our selection.